At the heart of competitiveness is opportunity. When Illinois provides qualified, motivated students with genuine opportunities, our entire state reaps the benefits. The Monetary Award Program (MAP) offers financial assistance to low-income students admitted to Illinois colleges and universities. MAP funding has been taken hostage in the budget impasse; Governor Rauner vetoed it in the budget the General Assembly passed last May and last month rejected a stand-alone measure designed to provide emergency relief for colleges and universities unable to continue educating MAP grant recipients without the state monies they have been promised. It is infuriatingly unnecessary that without higher education funding and financial assistance, in order to improve their prospects and make the most of their talents, many of our state’s young people now find they must leave Illinois – if they have the resources to do so. Too many do not. They live with the disappointment of a dream deferred, and meanwhile, our economic vitality, our quest for equality and our struggle for stronger communities wither on the vine. The House and Senate have repeatedly voted to release funds for MAP grants so that qualified, low-income students can continue to receive a college education. Yet the governor has ignored the pleas of countless students who want nothing more than to better themselves and our state. He has vetoed this legislation, jeopardizing not only the prospects of MAP grant recipients, but the continued survival of one of Illinois’ greatest assets – its public institutions of higher learning. Already, more than a thousand MAP grant recipients have been forced to stop going to class. They simply cannot afford to foot the bill while the state fails them. I was proud to vote with my colleagues this morning to override the governor’s irresponsible veto, which has the effect of consigning to poverty and underemployment a generation of young people who hold the future of Illinois in their hands. Sadly, the override effort fell just two votes short in the House this afternoon. My colleagues and I are not giving up; as I continue to fight for fair funding for mental health and addiction services, at-risk youth programing, women's health, homeless prevention and more, I will also keep at the forefront the state's obligation to keep its promises to students striving for an education and a better life. 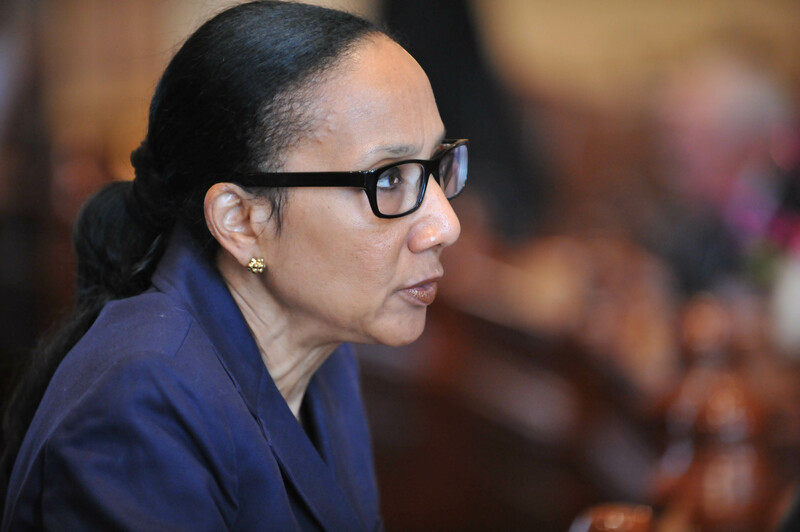 SPRINGFIELD – State Senator Jacqueline Y. Collins (D-Chicago 16th) voted yesterday, for the third time, to fund Monetary Assistance Program grants that allow low-income students to attend college this year. More than 1,000 Illinois students were unable to return to school after winter break because the lack of a state budget meant they did not receive the financial assistance they had been promised. Senate Bill 2043 includes $397 million for MAP grants, $260 million to keep community colleges open and nearly $50 million for career and technical education. Last May, the General Assembly sent the governor a budget that included these vital expenditures, but Gov. Rauner vetoed it, sending the state into a months-long budgetary impasse that has forced some of Illinois’ most effective social service providers to cut back or shut down, in addition to barring college students from their classes. In the fall, the Senate again voted to fund MAP grants, and then – as now – the governor threatened to veto the legislation. SB 2043 has received both House and Senate approval. The governor has 60 days after it arrives on his desk to decide whether or not to veto it. The shortfall in the Chicago Public Schools’ budget is roughly equal to the additional resources our schools would receive from the state if the funding formula and pension law treated CPS the same as every other Illinois school district. Gov. Rauner and Republicans in the General Assembly have not acted to bring justice and equity to the way the state distributes resources to schools. The governor has vetoed the budget we passed, starving after-school programs, youth anti-violence initiatives and assistance to homeless families of the resources Chicago’s at-risk children need to stay in school and succeed. Now he and his legislative leaders propose a takeover of CPS by the State Board of Education, an agency already struggling to fulfill its current mission without a budget and ill-equipped to manage the nation’s third largest school district. They propose a bankruptcy declaration for CPS – a legal maneuver that has exacted a punishing human toll in Detroit and Flint. And their plan would throw existing contracts and collective bargaining agreements into turmoil at a time when Chicago’s educators need greater stability and support, not less. Why not negotiate a balanced budget for state government before burdening it with drastic and unworkable new duties? Why not try fully and fairly funding our schools before declaring bankruptcy? And why not start with an elected school board instead of stripping all local control from CPS, with a promise to phase in school board elections at a later date? 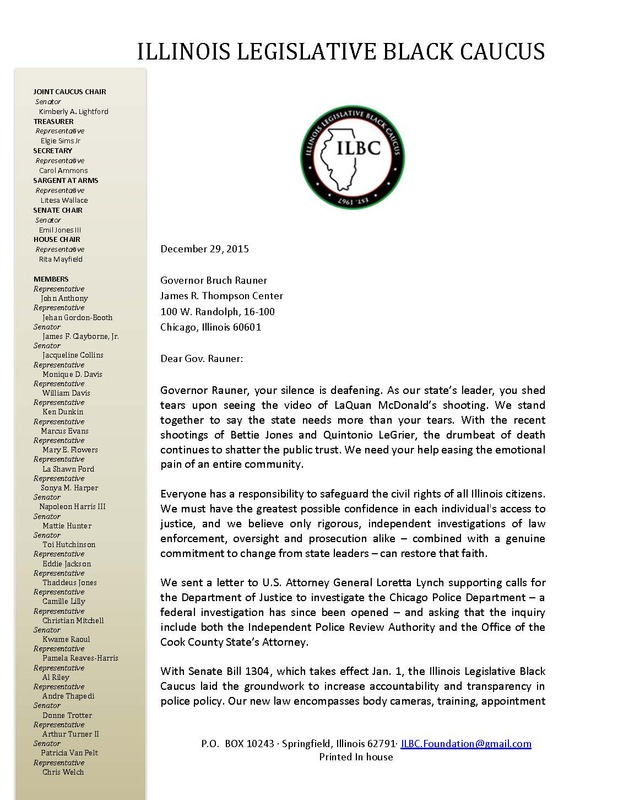 I am proud to stand with the Illinois Legislative Black Caucus in calling on Gov. 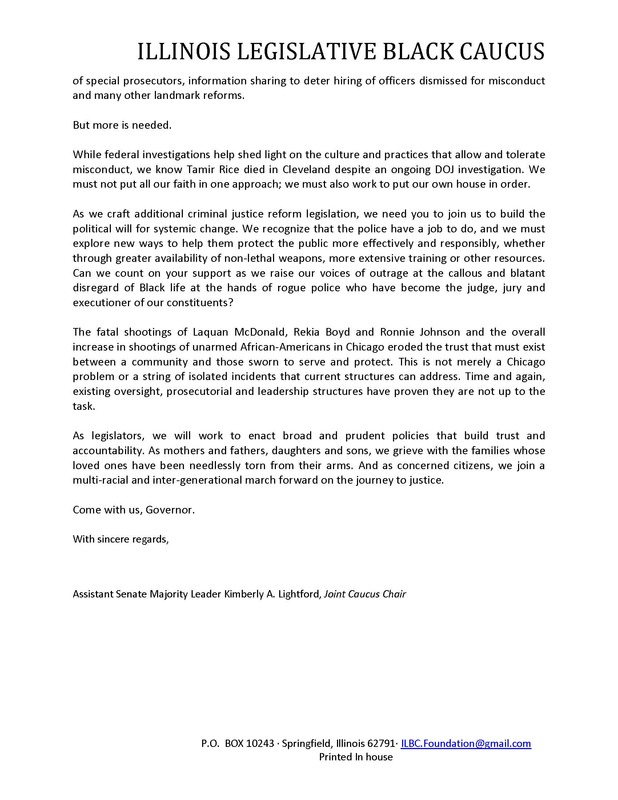 Rauner to help us end the scourge of police shootings and restore genuine trust between law enforcement and communities throughout Illinois. Alzheimer's: Do you know the warning signs?